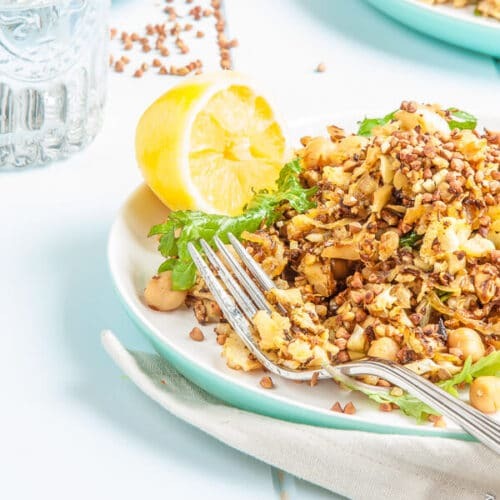 A wonderfully addictive vegan and gluten free cauliflower salad recipe with caramelised cauliflower, cumin, onions, chickpeas with a bright finish thanks to lemon zest and juice. Toasted buckwheat adds a final crunch. To say I love chickpeas is an understatement. I purchase big bags of dried chickpeas, and cook up a big batch, and then freeze them in individual portions. That way I have chickpeas on hand whenever I need them. I love scattering them in salads for a protein and fibre boost and a batch of hummus is always welcome as an afternoon snack. As much as I love chickpeas they aren’t the star of this salad. It’s the cauliflower. Fried until golden and tender, and tossed with cumin, coriander, fennel, lemon zest and lemon juice it’s an addictive combination. 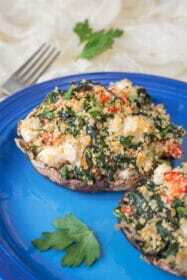 Baby kale adds a bit of colour and toasted nutty buckwheat adds a finishing touch, and crunch. If you follow me on Instagram you’ll know I’ve been playing with buckwheat lately. I’ve been playing with buckwheat birchers but haven’t come up with a flavour combination I love yet, but will share when I do. My favourite way to enjoy buckwheat though, is toasted. 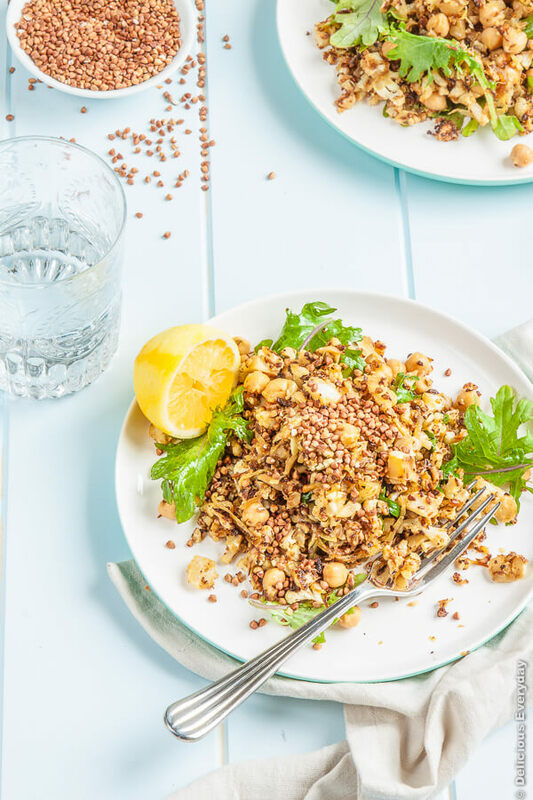 Deliciously nutty they add a wonderful crunch to salads and, despite its name, buckwheat is gluten free. Buckwheat is also cheap, compared to the likes of quinoa, and is higher in protein than rice, millet and corn. It’s a worthy addition to any vegetarian, vegan or gluten free pantry. 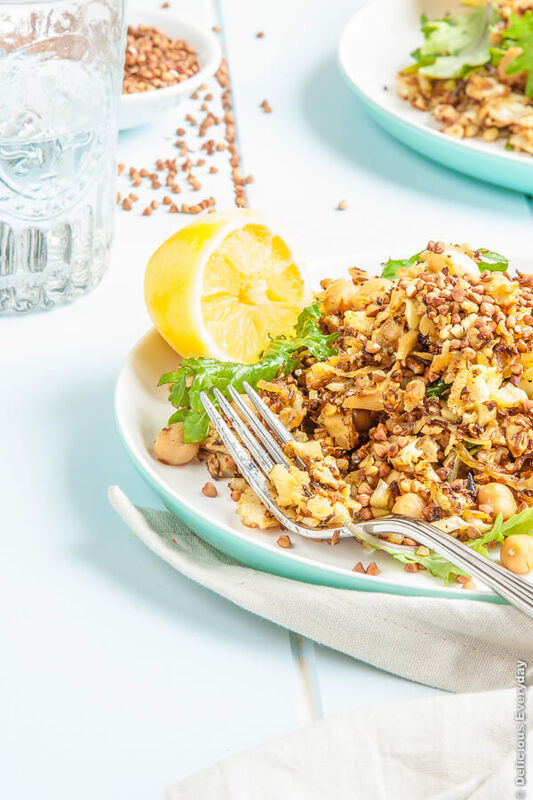 A wonderful vegan and gluten free salad that can be prepared ahead of time (it's also just as delicious the next day when the flavours have had time to mingle). Grind the cumin, coriander and fennel in a mortar and pestle as finely as you can. Place a large frying pan over a low heat. Add 2 tsp of olive oil and add the onion, garlic and spices and cook until the onion is golden and soft. Remove from the heat and place in a large salad bowl. Finely chop the cauliflower. I like to use the stalks too, but is up to you if you prefer to use the florets only. Increase the heat of the frying pan to medium high and add 1/3 of the remaining oil. Fry 1/3 of the cauliflower until golden and tender. Remove from the heat and add to the onions. Cook the remaining cauliflower and place in the bowl with the onions. Add the lemon zest and juice, along with the chickpeas and toss to combine and leave to cool completely. Wash out the frying pan and dry it completely. Place the pan over a medium heat and add the buckwheat. Toast for 3 to 4 minutes until golden and fragrant. Leave to cool. Before serving toss through the baby kale and season with salt and pepper. Sprinkle the toasted buckwheat over the top. Is there a way to make this salad without frying the cauliflower? I love this idea, but can’t stomach all the oil in this recipe! Thanks! You could toss the cauliflower in a small amount of oil and then roast it in the oven instead 🙂 I’d try roasting it at 180 celsius (350 fahrenehit). Let me know how you go. Yum, this sounds really good. I have only just discovered how great chickpeas are. I must try this recipe. Thanks for sharing! This is so attractive and would be so good for our healthier eating regime. I rarely use buckwheat but it is so healthy, I think I should try to! Scrumptiously healthy! The kind of salad I love to eat on a regular basis. I love cauliflower and I’m always looking for new ways to break up my lunch routine. This salad would be perfect! Oh I do love buckwheat. It’s my favourite flour for gluten free baking (especially when paired with chocolate) but rarely do I cook with the whole grain. I am going to have to make this very soon. I’m not usually a cauliflower fan, but fried until golden sounds like just the way to serve it to me. I never used to be a cauliflower fan until I started experimenting with it. It’s all in the way you cook it. Fried like this it is delicious. I struggle to let it cool before I eat it. But it is worth letting it cool as the flavours from the spices and lemon become more pronounced. Leftovers also stand up well the next day too!